Buy works – Benois Albert Nikolaevich | (1852, Saint Petersburg -1936, Fontene-o-Roz, close to Paris). Benois Albert Nikolaevich (1852, Saint Petersburg -1936, Fontene-o-Roz, close to Paris). Master of painting in water-colours. Since 1871 until 1877 studied at Academy of Arts, at the department of architecture, at the same time studying water-colour painting under L.O. Premazzi. Worked in the genre of landscape, continued romanticism traditions. Since 1885 until 1894 was a teacher in Academy of Arts in St. Petersburg, being its full member. Had close links with the Imperial Court. Became a first custodian of the Russian museum in St. Petersburg (1895), and also served as an artworks inspector for the Department of commerce and manufacture, Manager of the Museum of applied arts under the Commissariat for commerce and industry in Petrograd. 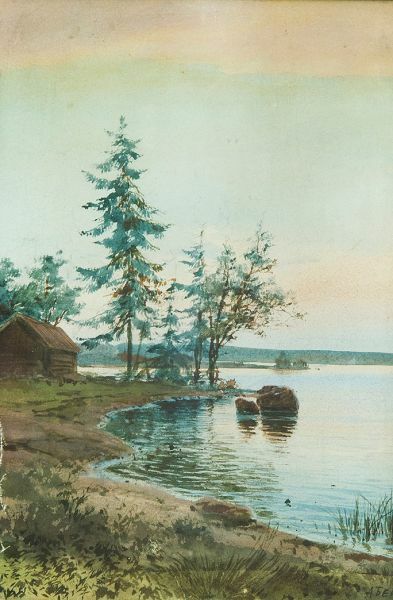 Since 1887 was a found member and the head of the Society of Russian aquarellists. Became an active participant of museum life during the first after-revolutionary years. Much traveled around Western Europe, North Africa, Caucasia, Crimea, Volga region, Middle Asia and the Far East. In 1924 he emigrated to France and settled in Paris. The artist's works are kept in State Russian Museum. Year: The end of the 19th - the beginning of the 20th centuries. Technique: Paper laid on cardboard, graphite pencil, watercolour. The Сoast of Gulf of Finland. Technique: Paper, water - colour. 70000 - 120000 rub. 70000 - 120000 rub.